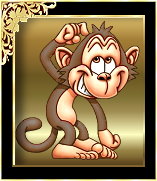 I just noticed your cute little monkey avatar and had to see what it would look like cut out and sitting on two cents! Then I made a background for it, and framed it in a copper frame. Oh, then, of course, I had to see what it would look like blinking! If you'd like to use either of these, feel free to! If not, it's fine. They were fun to do! I'll sure try and see what I can do for you! I gave your lil ladybug a rest and replaced her with a happy jackolantern. Then I thought, maybe a lil devil in the tree! Then I said, the heck with it, how about a witch and a devil? Let me know how you feel about these. Thanks Brandi, I like the loaded up one with the witch and the devil. Changing the ladybug for a pumpkin was just perfect. later when I return tonight, I shall attempt to save my Kitti-cat and install the updated glitzed up version. Thank you so very much. I wish I knew how to do what you do, but that's OK, it would take years for my computer-illiterate brain to absorb it. Thanks. I'd never forget you. I'll go look them up. I also posted your monkey in brown as you requested. I'll go find both posts and give them to you here in a moment. Well, I need to eat half a plate of crow! I didn't forget you. I made 7 avatars for Halloween for you. But I did forget to load them to photobucket and to post them here! I am so sorry! Different sized pumpkins .. similar to your acorn drop! The you asked to see what your monkey would look like if it were brown. The brown ones are not avatar sized. I made them a little bigger just to show you. Again, sorry for the mixup and my omitting your post! If you are still having a problem, let me know. I can help or ask Klaas to do it for you. BTW .. I just made you a PURRRFECT Christmas design! I just love it. I think you will too. Brandi, thank you so much for the beautiful avatars to choose from. I haven't had a chance to be on-line much over the summer, so it really means a lot that you thought of me and my avatar. Brandi, Thank you so very much for dressing up Kitty. He's so cute. Kitty-cat is now installed, and original saved. It's been quite awhile, but it was easy after all. Good blessing for you. I just found it and have saved it to my computer and to my PB account! WHEW!! Sorry to have bothered you. I also have a copy of your original, so if you ever need it, just let me know. You are very welcome. Glad you came by and found them! Brandi-that was so nice to think of me! To be honest, I don't celebrate Halloween. Fall is my very favorite season though (crisp cool air, the vibrant foliage colors, brilliant blue skies, candy corn for all, and fun activities/family birthdays). I hope I didn't hurt you feelings or offend you in any way. Thank you so much!